Broken Arrow, Oklahoma – October 3rd, 2018 — RISE Armament, a premier manufacturer and supplier of AR firearms and components is pleased to introduce the all-new 300LE rifle. This firearm is set to be the headliner of RISE Armament’s new Law Enforcement (LE) Division — RISE LE. Motivated by the July 7, 2016, Dallas police ambush, RISE Armament set out to ensure that no police officer is ever outgunned by a criminal. RISE made it their mission to develop a supremely accurate, highly dependable rifle that’s affordable on a law enforcement budget. The 300LE is that rifle. 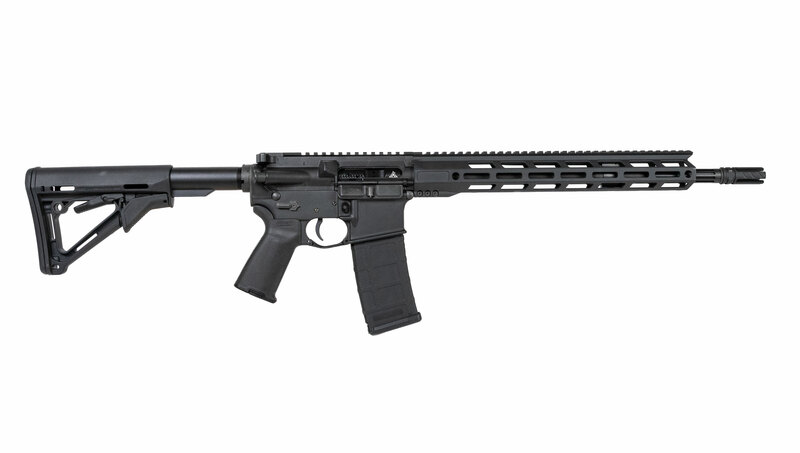 RISE Armament developed the 300LE with input from SWAT/SOT/SRT officers, patrol officers, military snipers, competitive shooters, and firearms instructors to ensure it combined the best in functionality, accuracy, dependability, and affordability. From a squad car to an entry team, it’s duty ready right out of the box. The 300LE is chambered in .223 Wylde, which is highly accurate with both .223 and 5.56 ammunition. RISE developed an advanced flash hider specifically for the 300LE, which ensures flash minimization in low-light environments to avoid affecting the user’s night vision capabilities, yet it minimizes the ring that is common with that type of flash hider. The 300LE is a feature-rich firearm that is ready to meet all the demands of law enforcement members. Advanced flash hider — Developed specifically for the 300LE, the four-prong flash hider ensures flash minimization in low-light environments to avoid affecting the user’s night vision capabilities. Additionally, the annoying ringing that’s typical with this type of flash hiders was engineered to be nearly nonexistent. CB-160 match-grade barrel — With superior accuracy and proprietary weight reduction, this barrel is a favorite among top competitive shooters. The 416R stainless steel barrel shoots sub MOA with most factory ammo, and many shooters regularly record hits out to 600 yards with heavier, duty-type ammo. It has a 1:7 twist, ½ x 28 threads, and mid-length gas system for more manageable recoil. LE Handguard — The 13.5-inch handguard has a continuous 12 o’clock top rail, MLOK slots for attachments, a slim profile for comfort, and skeletonized design for weight reduction. LE145 Tactical Trigger — Designed for peak performance in high-adrenaline situations, it features a crisp, balanced break and 4.5-pound pull. Ambidextrous safety — The ambi safety features a long throw or short throw, along with interchangeable paddles, so an agency’s gunsmith can tailor the safety selector to the shooter's preference or department policy. Includes one magazine. Iron sights and/or a Vortex Crossfire red dot sight are available as a budget-friendly add-on. We’re machinists, engineers, executives, hog hunters, target shooters, and coyote killers. Some of us are veterans; all of us are patriots. We’re God-fearing, country-loving, down-to-earth folks who take pride in providing TIER 1 products to our fellow countrymen. We work hard. We play hard. Our values run deep. Our roots are in manufacturing — machining and fabricating for the oil and aerospace industries. In the past, we would shoot and build a few guns when we got the chance. Now, we still shoot, and we manufacture lots of guns. We also machine gun parts and accessories. Our objective is simple — to unleash every shooter’s potential and elevate the shooting experience. Out of all the number designations you could have chose, you chose 300? What will you call the 300 blk variant? This would be awesome I've been looking for a good 223 for taking care of some hogs. It would be an honor to win this weapon. Sounds like an exceptional entry in a crowded field. Exciting. If I win it'd be my first rifle! Slowly saving up for one. How does one enter the drawing for the giveaway?? By leaving a comment or what?? That's a very nice piece of equipment to have. ItsSoBasic Want to trade for a Winchester 67 with a broken stock, an RG38, and a Jimenez .22 with no mag? I'm trying to trade my truck for a rifle and a couple handguns. Anyone interested? Nice, bet it would eat any ammo you feed it. That would look great in the collection. Iv been looking for a AR and this looks nice! Hopefully I can win !